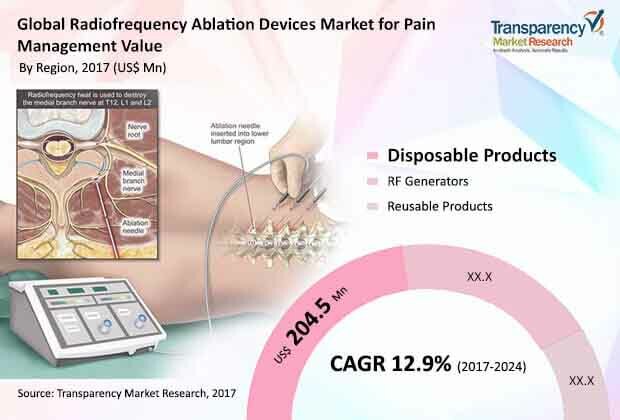 A recently compiled business intelligence report developed at Transparency Market Research (TMR) has detected that the shares in the radiofrequency (RF) ablation devices market for pain management are heavily consolidated among a handful of global players. The report has identified St. Jude Medical, Inc., Boston Scientific Corporation, Halyard Health, Inc., Stryker Corporation, and Diros Technology, Inc. as the top five companies in the global radiofrequency ablation devices market for pain management, with the former three considerably ahead of the curve. St. Jude Medical's position of dominance in this market is due to the company’s diversified product portfolio, extensive geographical presence, and acquisition strategies that it frequently undertakes. Additionally, the Company has a strong focus on research and development to offer innovative and efficient medical device product to their customers. On the other hand, with increasing competition and decreasing reimbursement rates, Boston Scientific Corporation competes on the basis of price, value, and efficiency in the radiofrequency ablation devices market for pain management. Current trends in health care are likely to exert pressure on the company’s offerings having differentiated clinical and economic outcomes. As for the new players, high cost of production and significant capital and expertise in R&D activities is expected to keep the entry barriers high. According to the estimations of the TMR report, the global radiofrequency ablation devices market for pain management will be worth US$1,114.5 million by the end of 2024, with the demand projected to increment at a CAGR of 12.9% during the forecast period of 2017 to 2024. As of 2017, the disposables were the key product segments whereas hospitals generated most of the demand in terms of end-users. Geographically, Europe and North America are expected to produce the most prominent chunk of demand, although the Asia Pacific radiofrequency ablation devices market is primed to prosper at a much stronger growth rate. Numerous factors are expected to formulate a healthy progress in the RF ablation devices market for pain management, but none bigger than the growing percentage of geriatrics who commonly suffer from joint disorders such as arthritis. According to the United Nations, people aged over 60 years constituted for 13% of the world’s population as of 2017 and the percentage will continue to mount in the near future. The analyst of the report has also observed that the demand for minimally invasive procedures are on the rise as they offer quick relief without the need for longer hospital stay. The field is being rigorously researched thanks to increased investments by multinational companies and new products are being approved and launched, which will bear fruits in the near future. On the other hand, compliance with the laws and regulations set by regulatory authorities that are associated with clinical trials, product approval, commercialization, design, and development has been a major concern among ablation device manufacturers. Ablation devices fall under class III medical devices category in the U.S. and Europe. Hence, safety and efficacy of devices such as generators and catheters and other associated products are paramount for regulatory agencies. Such stringent regulations not only delay the approval and launch of the product, but also increase the cost of the devices to meet the set standards of the FDA, CE, and other regulatory agencies. Availability of various other pain management therapeutics such as opioids, NSAIDs, anticonvulsants, and antidepressants are also restraining the market from attaining its true potential.